As I mentioned earlier I have been reading Badiou's Theorie du Sujet. In many ways I find it be comparable to Althusser's For Marx. 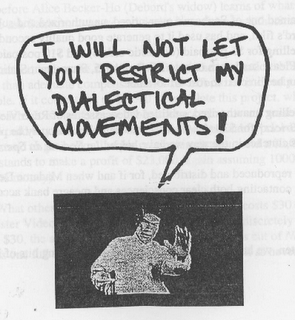 In each case there is an effort to draw out the philosophical implications of some of the revolutionary slogans of the past century (One divides into Two) as well as an attempt to revive the dialectic. In Althusser's case this takes the form of overdetermination while in Badiou's case it entails splitting the dialectic itself into one of places and forces. What interests me about this is that at the time that I became interested in philosophy the dialectic was the enemy. 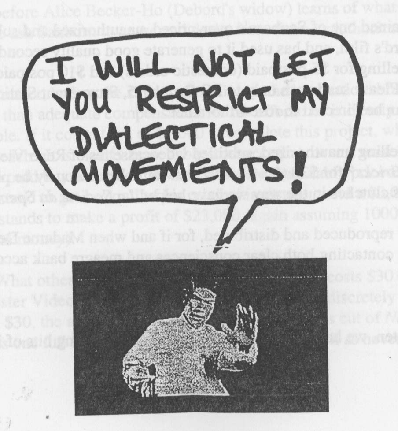 The charges were so well known that they did not even need to be articulated: the dialectic totalizes, it simultaneously elevates and reduces all difference to contradiction, etc. Now these criticism are for the most part true, but at the same time there is a whole series of attempts to push the dialectic into new directions, to think difference, singularity, and antagonism: I am thinking of Adorno, Althusser, Badiou, and to some extent even Sartre. In some ways the situation is similar to Marxism itself. On the one hand, Marxism appears to the very model of dogmatic thought, the repetition of key formulas as doctrine, but on the other hand there are real innovations in the work of those who call themselves, or are called, Marxists. Most notably while the various other philosophical "isms" restrict themselves to the topics that the philosopher in question cover, there are Marxist (Marxian) philosophers of language, literature, and film, even though Marx wrote nothing on these topics. Innovation at the heart of repetition: one divides into two. It is too long of a story to tell, but I ended up at a bar last Friday night listening to what could only be described as a bar band. They were not one of those cover bands that dedicate themselves to one band, like "In the Spirit of the Doors: Riders on the Storm"etc, but a band that covered a wide variety of different songs (not a wide variety, there entire set could have been an hours listening of any classic rock station on a no repeat Monday--Zeppelin, Sly and the Family Stone, Bob Marley, Earth, Wind, and Fire, Peter Gabriel). There range was perhaps the only thing impressive about them, although it was unintentionally amusing to watch the horn section try to look busy during the sans-horn- Zeppelin covers. Couldn't someone at least give them a cowbell? 1) Classic Rock. When I was in high school classic rock was the default music selection for most Frat Boys, all of whom owned their copy of Bob Marley's Legend, assorted Zeppelin cds, and related music. Even during the late eighties this seemed odd, a bunch of kids living off of someone else's nostalgia. Given that I was older than most of the drunk and enthusiastic crowd on Friday it would appear that this has not changed much. Classic rock will outlive the babyboomers. 2)Continental philosophy. It has occurred to me before that most of the Anglo-American Continental Philosophy scene is structured sort of like the world of cover bands. You have your Nietzscheans (who write on Nietzsche, or in "the spirit of Nietzsche"), Heideggerians, Derridians, Deleuzians, and so on. All of whom produce very interesting commentary, but it leaves you wondering if anyone will ever write any originals. But perhaps I am being too harsh. This post is great, and the parallel between continental philosophy and bar cover bands is incredible. I wonder if one can extend the picture a bit. A friend of mine used to play in a ... a funk-ska band in Chicago in the late 90s. My friend was a punk rocker and ska kid and always tried to get the band to play all ages shows and to write different sorts of songs. Much of the band really liked to play those shows, for the energy, but the decision makers in the band tended to push for playing in bars to less enthusiastic audiences and writing music more for the latter audeience. The money was better, by a whole lot. I wonder then if the problem is not continental philosophy but professional continental philosophy, just as the problem with the bar band is not bands or rock bands but bar bands. As in, the better works will emerge elsewhere? Or not.